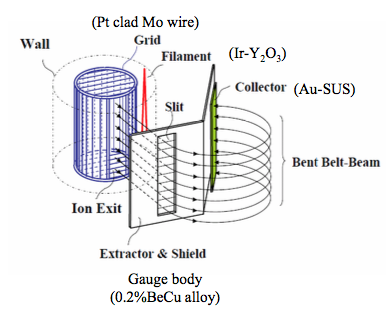 XHV Gauge Head - 3B Gauge | Japan Vacuum Instruments Ltd.
♦ Reduction of soft X-ray & ESD by Bent Belt-Beam method. 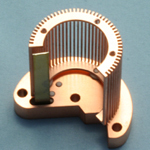 ♦ Low outgassing hot-cathode gauge by using 0.2% BeCu alloy body. What is Bent Belt-Beam (BBB) Gauge ? 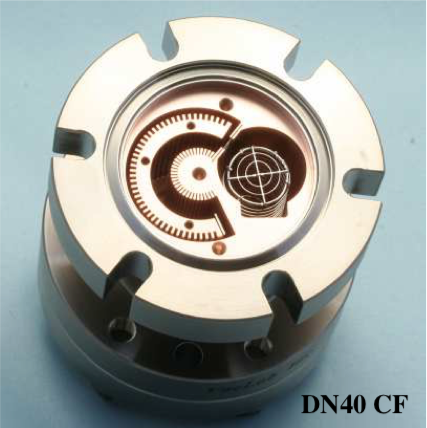 3BG-03 is a commercially extreme-high vacuum hot-cathode ionization gauge head that can measure pressures as low as 5.4e–12 Pa (5.4e-14 mbar), by reducing the limits imposed by soft x-rays, electron-stimulated desorption (ESD), and outgassing. The gauge construction includes a cylindrical grid, which is closed at both ends; ions are drawn from the grid through a long, axial slit made in the cylindrical surface. Thus, the ion beam that emerges forms a "belt". This belt-like ion beam is guided on a curved path by a cylindrical sector deflector and terminates on a plate collector arranged after a beam trajectory rotation of 240°. These elements are embedded in a solid cylinder of 0.2% BeCu alloy, which has a low emissivity (radiation factor) and high thermal conductivity. As a result, the effects of heat radiation and outgassing (caused by the hot-cathode filament) and soft x-ray photoemission (the grid is the soft x- ray source) are reduced in the deflector/collector region. 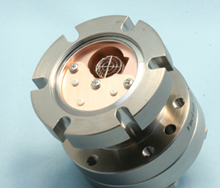 This electrode arrangement can also greatly decrease the flux of soft x-rays and ESD in the direction of the belt ion beam because it sets to 90° the angle between the extracted gas-phase ion beam and the maximum flux of soft x-rays and ESD. 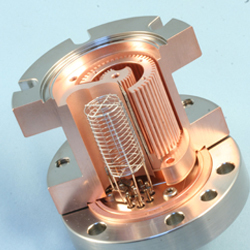 In addition, it achieves an extremely low pressure measurement limit by minimizing loss in the ion transport, and because the collector is well hidden, being located after the large deflection of the ion beam. 3BG can be operated with Prevac MG15 or Leybold IM540.